Love is life’s end, but never ending. Love is life’s wealth, never spent, but ever spending. Love’s life’s reward, rewarded in rewarding. – Herbert Spencer. 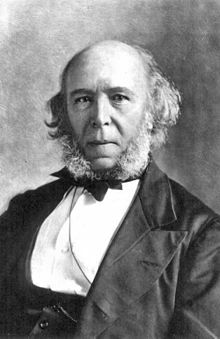 Herbert Spencer (27 April 1820 – 8 December 1903) was an English philosopher, biologist, anthropologist, sociologist, and prominent classical liberal political theorist of the Victorian era. Spencer developed an all-embracing conception of evolution as the progressive development of the physical world, biological organisms, the human mind, and human culture and societies. He was “an enthusiastic exponent of evolution” and even “wrote about evolution before Darwin did.” As a polymath, he contributed to a wide range of subjects, including ethics, religion, anthropology, economics, political theory, philosophy, literature, biology, sociology, and psychology. During his lifetime he achieved tremendous authority, mainly in English-speaking academia. “The only other English philosopher to have achieved anything like such widespread popularity was Bertrand Russell, and that was in the 20th century.” Spencer was “the single most famous European intellectual in the closing decades of the nineteenth century” but his influence declined sharply after 1900; “Who now reads Spencer?” asked Talcott Parsons in 1937. Spencer is best known for the expression “survival of the fittest”, which he coined in Principles of Biology (1864), after reading Charles Darwin’s On the Origin of Species. This term strongly suggests natural selection, yet as Spencer extended evolution into realms of sociology and ethics, he also made use of Lamarckism.